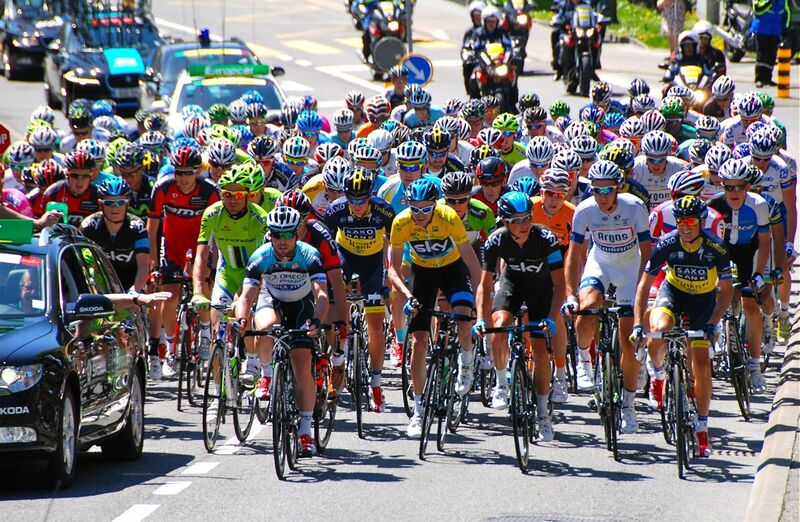 As a fan of professional bike racing, one of the great advantages of living in Switzerland is my proximity to many of the great bike races that take place every year in Europe. The Alps, in particular, are an irresistable venue to the organizers of epic stage races like the Tour de France, the Tour de Suisse and the Giro d’Italia. Any given year one has a pretty good chance of being within a few hours drive of seeing at least a stage or two of these famous races. So when we moved here I resolved to take advantage and try to see as many races as I could. In 2013 I kept an eye on the UCI race calendar to make sure I could see a few. Above all, I was hoping to see a stage of the Tour de France, which was celebrating its 100th anniversary. To mark the event the Tour organizers planned a particularly grueling stage for July 18th, during which riders would climb the mythic 21 hairpin turns of Alpe d’Huez not just once but twice! I was determined to be there that day. 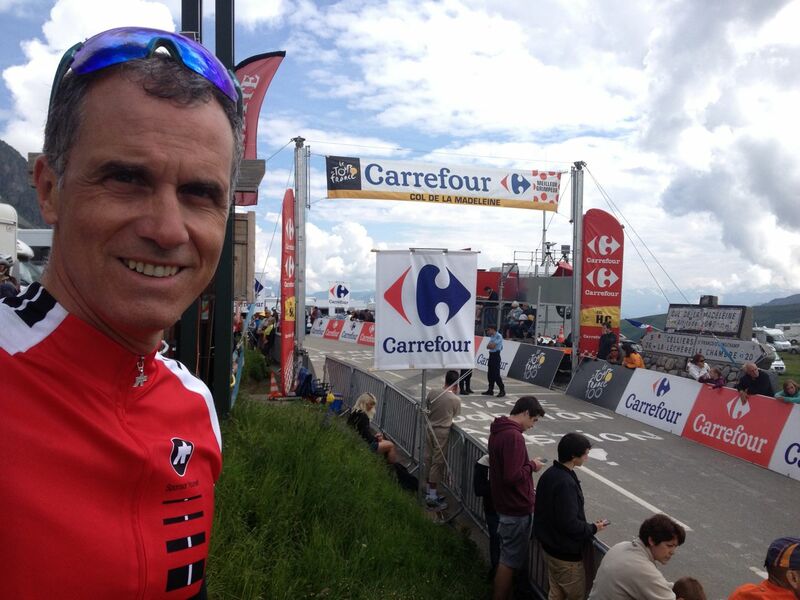 Yours truly at the top of the col de la Madeleine, awaiting the arrival of the Tour de France peloton. As luck would have it, I managed to see at least one stage each from the Tour de Romandie, the Giro d’Italia, the Criterium du Dauphinée, and, of course, the Tour de France. Furthermore, I wasn’t interested in just being a spectator. In most cases I managed to combine watching the race with getting in some challenging riding of my own, usually on the same race course as the pro peloton a few hours before the riders came through. What follows are brief accounts of the races that I saw and the riding that I did, along with some impressions of the sport and those who follow it. 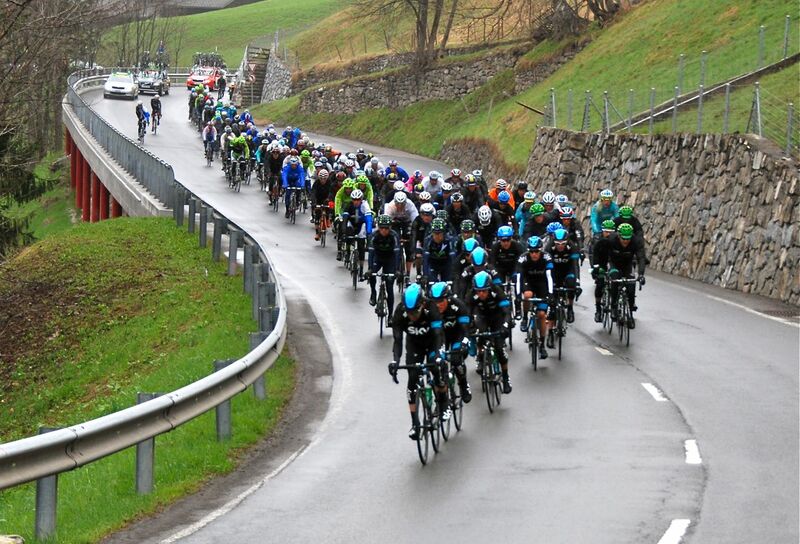 This is the first of three posts, which covers the Tour de Romandie. Part II will discuss the Giro and the Criterium du Dauphinée. Part III will be devoted to the Tour de France. 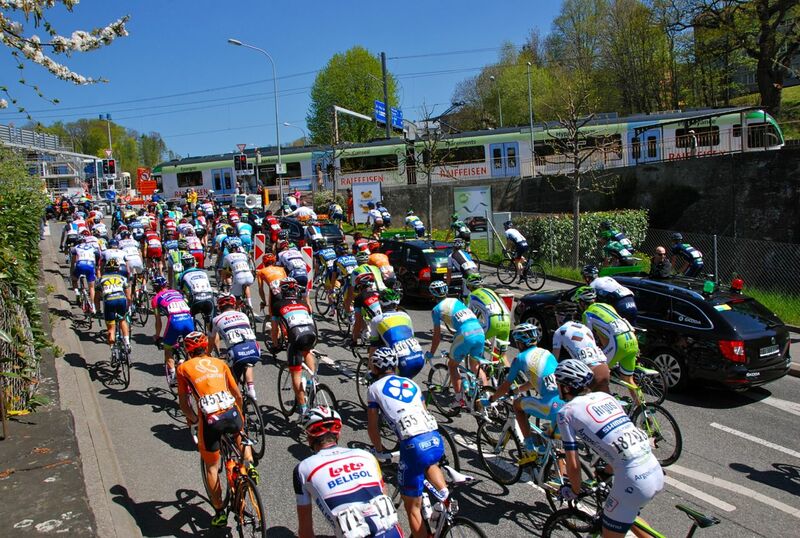 The first race I witnessed was the Tour de Romandie, which takes place in late April and is one of the first big stage races of the year on the pro calendar. The race winds its way around the French-speaking part of Switzerland for a week and includes a mix of both flat and mountain stages, as well as an individual time trial. For this reason it is a popular tune-up race for those planning to ride the Tour de France. In fact, the last 2 winners of the Tour de Romandie, Bradley Wiggins and Chris Froome, have gone on to win the Tour de France the same year. 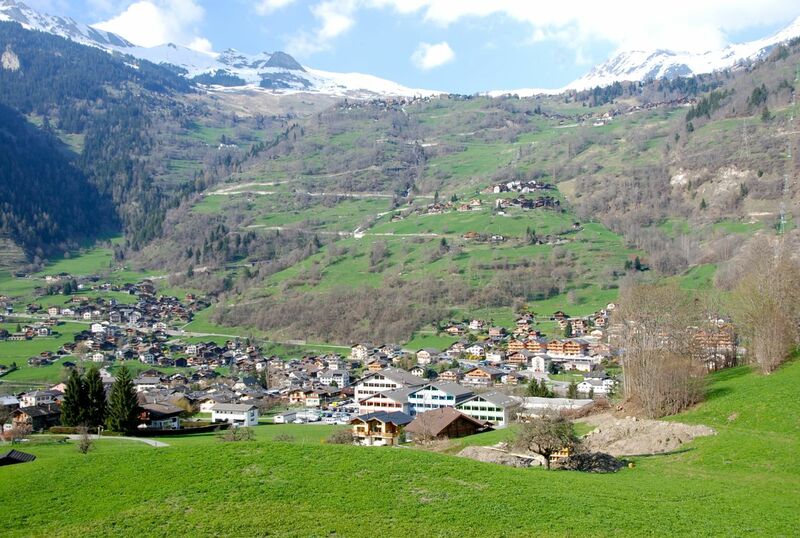 i caught up with this year’s Tour de Romandie in the town of Le Chable, which sits at the bottom of the cable car that leads 1500ft up to the ski village of Verbier. The race was to begin with a short 7.5km afternoon prologue, although this year the organizers added a twist by taking riders up almost 1,000ft to the ski station at Bruson, which favoured the climbers in the peloton for sure. Another feature of the day was that the organizers put on a citizens’ “Contre la Montre” race in the morning using the same course as the pros. I couldn’t resist the opportunity, despite my relative lack of training. Looking across the valley to Le Chable, with Verbier high above, from part way up the prologue course. The day of the prologue I drove to Le Chable early in the morning to participate in the citizens’ race. It was fun to share the roads with the pros during my warm-up, who had arrived to inspect the course prior to the afternoon prologue. It was also quite remarkable how “just-in-time” some of the race infrastructure is. All along the race route crews were busily setting up roadside sponsorship banners and blowing air into the huge inflatable arches marking key points on the course. One almost fell over onto a group of pro riders as they were passing underneath! As far as my race went, I really suffered, but I was pleased with my result. I went out too fast in the initial few kilometres, which climbed gently, so that by the time I hit the steeper half of the course I was already full of lactate and my legs felt like lead. I wobbled rather than sprinted across the finish line in a time of 20:46, good enough for 4th in my age group! After the citizens’ race I headed into the race village to check out the team buses and bike pit area. I was immediately struck by how open, accessible and casual it was in the race village and pit area. 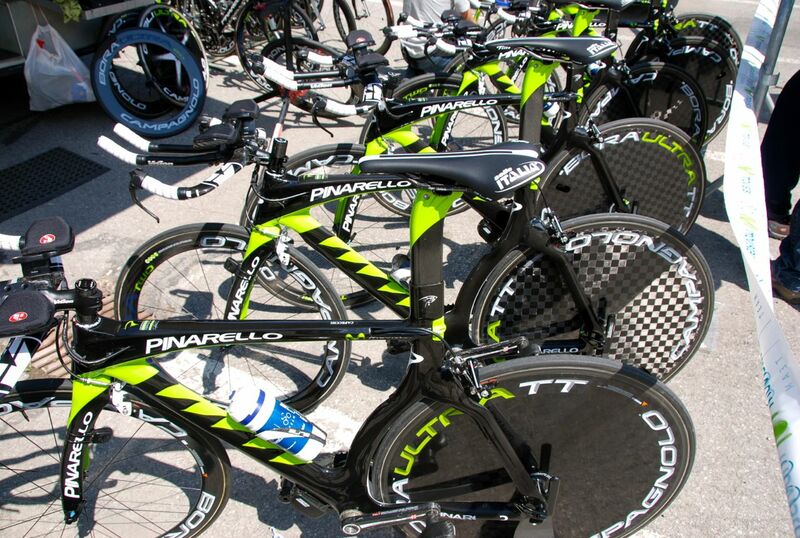 Along with a few dozen other race enthusiasts, I was able to mill around the pits admiring the fleets of $20,000 bikes and row upon row of expensive carbon wheel-sets. 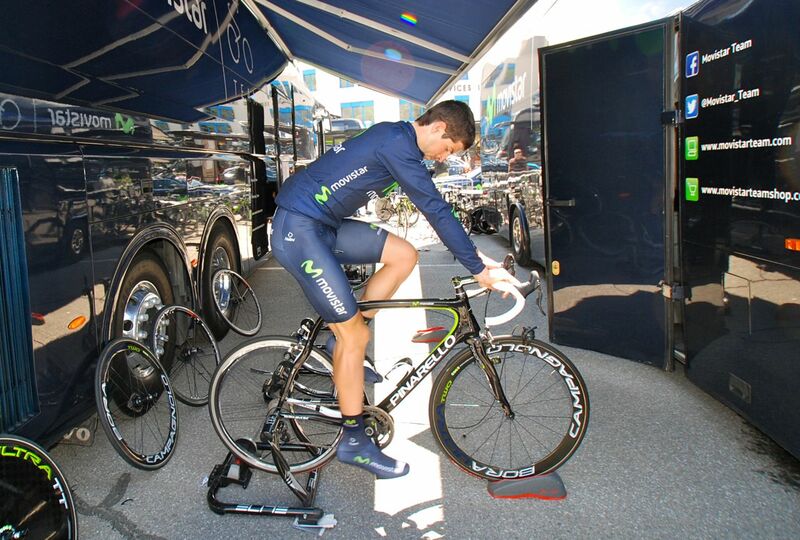 Meanwhile, bike mechanics casually went about cleaning and preparing equipment while the athletes began arriving and doing their warm-up routines on wind trainers parked outside the team vans. Warming up in the Movistar pit area. At one point, while standing in front of the Team Sky pit, a team car rolls up and out jumps Chris Froome (spoiler alert: eventual winner of the 2013 Tour de France), who starts casually chatting with the mechanics after signing a few autographs. No big deal. Soon it was the pros’ turn to tackle the uphill prologue course. I spent the next couple of hours walking along the course and sitting in the sun watching and cheering as riders came through one at a time. One of the things that really struck me about this event was how many vehicles were involved. Each and every one of the 168 riders was accompanied by an entourage of up to 4 vehicles: a gendarme on motorcycle up front, followed by a race commissaire (official) and a TV crew, both on motorcycles, and a team support car bringing up the rear. This is not to mention other official, VIP and sponsor vehicles occasionally passing by. All told that made for almost 700 vehicle trips up the tiny narrow road to Bruson in the space of a couple of hours! Clearly, while cycling itself has a small carbon footprint, professional bike racing does not! 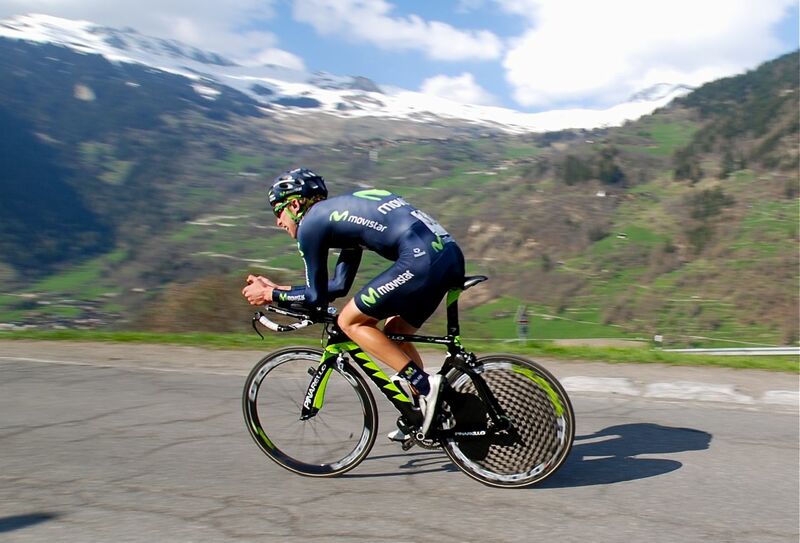 Movistar’s Rui Costa on course. Costa would go on to become World Road Race Champion this year. As for the results, the climbers in the peloton dominated the top 10 spots, as anticipated, with Chris Froome coming out on top by a margin of 6 seconds, with a time of 13:16. Nevermind that his time was 7 and a half minutes faster than mine!!! I was only 4:40 behind World Road Race Champion Mark Cavendish y’know, and a mere 3:45 behind the last place finisher! I’m still waiting for the pro contract offers to arrive in the mail (hey Team Sky, I’m still available!). 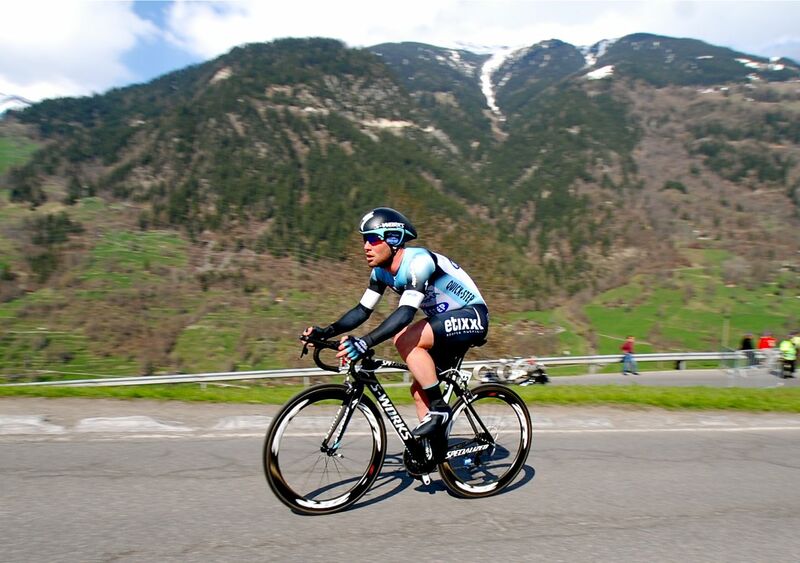 The next two stages of the Tour de Romandie were exciting for me because they were held on some of the very same roads that I ride and train on every day, and because they featured a start and a finish practically in my backyard. The last 60kms of Stage 1 used one of my favourite training routes that passes through the picturesque medieval town of Romainmotier (with church foundations dating back to the 5th century AD) and then climbs 2000ft up and over the col du Mollendruz before plunging back down to Lausanne. The finish line of the day’s stage was located in the village of Renens, part of greater Lausanne, and just a 10 minute bike ride from our house. Needless to say I was there for the exciting sprint finish, which was won by Gianni Meersman of Omega-Pharma. I just happened to be standing near the Omega-Pharma bus when Meersman was being congratulated by his teammates, who include 2013 World Time Trial Champion Tony Martin. A number of gawking fans approached Martin for photos, so i decided to get into the act too (thanks Tony!). I was too dignified to start running around pinching souvenir water bottles off the riders’ bikes, however, as I saw some fans doing. 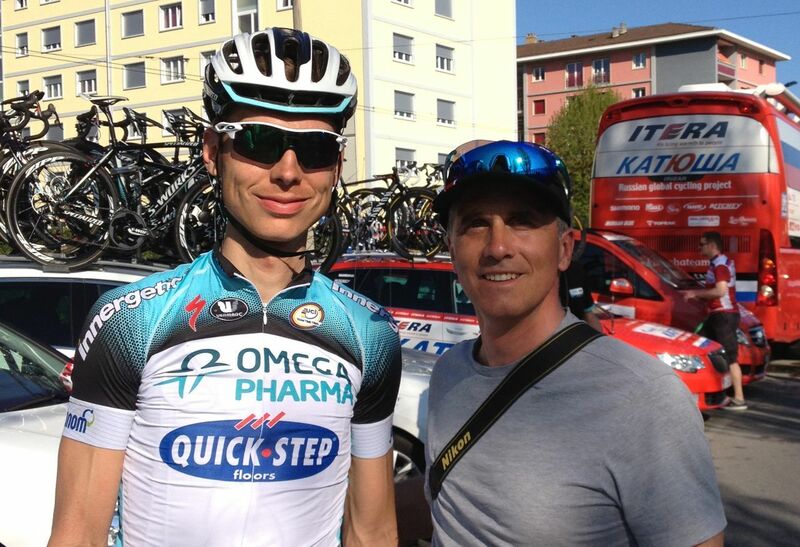 Me and my buddy Tony Martin, World Time Trial Champion. 10 minutes later Mark Cavendish rolled up to the van and I had a chance to ask a similar favour, but after experiencing a mechanical that ruined his chances for the stage win, he didn’t appear in the mood so I left him alone. The funny thing about an event like this, particularly with a sprint finish, is that while an entire village is mobilized months in advance for the big day (and communities usually pay organizers a fee to host a race start or finish), the whole thing is over in seconds. For much of the day traffic is disrupted, roads are closed, dignitaries appear, sponsors dole out free stuff, spectators gather to drink and smoke (and smoke and drink), and local school children are drafted as cheerleaders. Meanwhile, the peloton comes into view and screams across the finish line in 20-30 seconds and then it’s over. After a few media interviews and a quick podium ceremony, it’s over, the riders are gone, c’est tous! The following day the Tour came even closer to home. Stage 2 started in the neighbourhood of Prilly, immediately adjacent to Jouxtens-Mezery where we live. The race began with the usual neutral roll-out, only this time the riders and the convoy of team cars passed barely a kilometre from our house. I went out to the road to take a few pictures and wish them well. All the big names up front for the start of Stage 2 in Prilly. Oddly enough, it seems no-one told the local commuter train that there was a race going on, and so within the first kilometre or so the pro tour peloton suddenly found itself halted by a passing train. The riders had a good chuckle while the train lumbered by, and a few took advantage to take a bathroom break (c’mon guys, how many times have I told you to pee before the race starts!). No one thought to tell the train there was race going on? I caught up with the Tour de Romandie one more time for Stage 4, considered the “Queen Stage,” which was to include 4 categorized climbs over 188kms, including 2 trips up and over the famous col de la Croix (1778m), with an exciting finish at the bottom of the climb in the ski resort town of Les Diablerets. Normally covered in metres of deep snow at this time of year, the local community had pulled out all the stops to clear the road to the top of the col weeks ahead of its normal opening time. 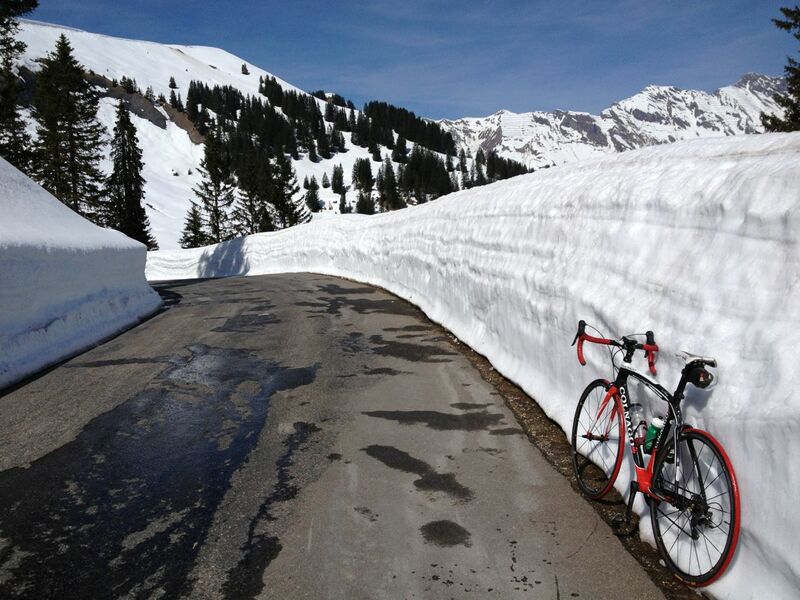 Near the top of the col de la Croix, in very early season. The day was also to mark my first day working as a cycling guide. 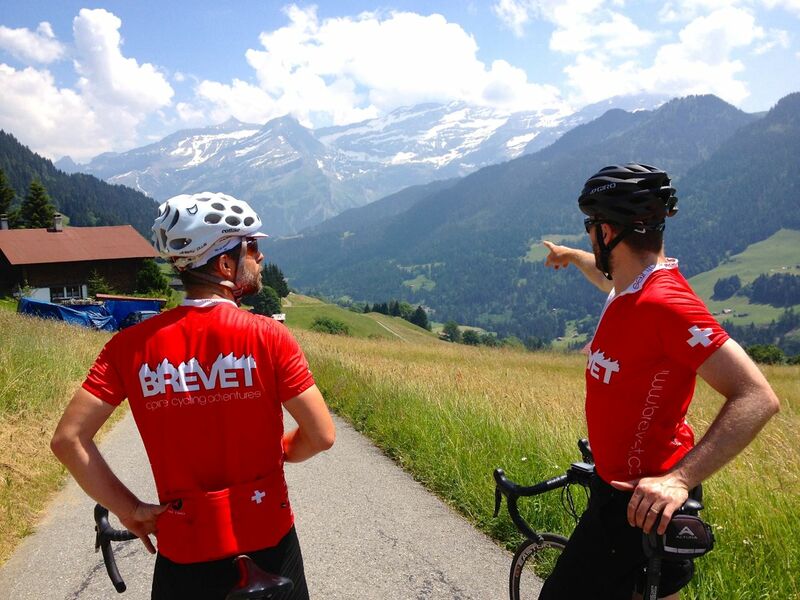 I had just recently connected with a UK expat named Tom Eeles who has a cycling tour company called Brevet, based out of Les Diablerets, that targets fit and experienced cyclists looking to challenge themselves in the Alps. Tom invited me to join him and some guests that day to take on the col de la Croix ourselves before heading into Les Diablerets to watch the finish of the race. 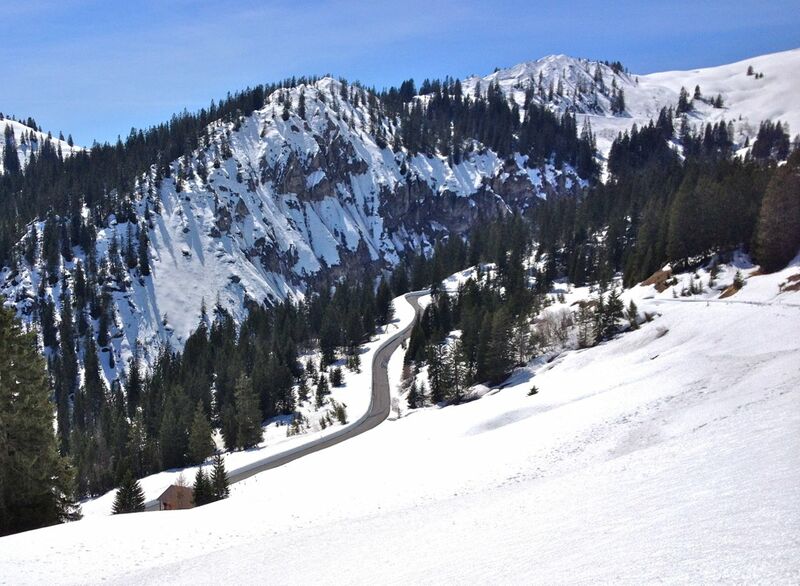 The col de la Croix on a fine day in April. Local crews did an amazing job clearing the snow. Raf and Tom on a Brevet guides recce ride. Unfortunately, both for us as well as the race organizers, the weather forecast for Stage 4 was grim, calling for temperatures to fall throughout the day to within a few degrees of 0, with rain in the valleys and snow up at the top of the col de la Croix. As a result, race organizers re-routed the race to exclude the 2 trip up the col de la Croix and the steep decent down into Les Diablerets, in favour of a long gradual climb up to the finish. Chris Froome was leading in the GC at this point by a narrow margin of a few seconds and the decision played into his favour, as a somewhat more timid descender than some of his rivals. Froome was widely expected to attack on the final climb before Les Diablerets and any chance of his rivals making up the gap on the final descent was eliminated. The Sky train chasing down a break before climbing up the col de la Croix. The miserable weather didn’t alter the plans of our Brevet group, mind you. Dressed in as many layers as we could find, the group set out from the hotel in Les Diablerets to tackle the col de la Croix in the rain and frigid temperatures. One group planned to climb to the top and then descend immediately back down to Les Diablerets. Inspired by the original route of Stage 4, a second group, consisting of myself and two guests, planned to go up and over the top and descend 8kms down the other side to the village of Villars, before turning around and climbing back up and over the col a second time, then descending into Les Diablerets. 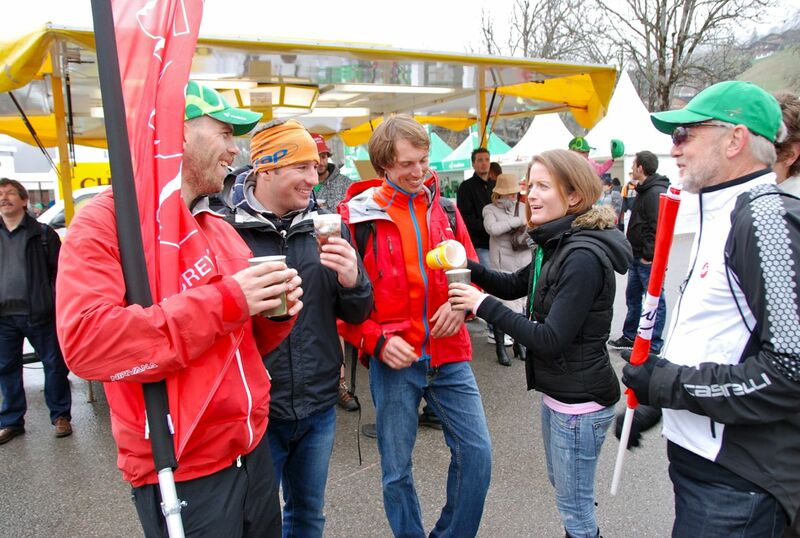 Brevet’s Tom Eeles (left) sharing a beer with guests in the race village at Les Diablerets. Our first trip up to the top of the col didn’t pose any significant problems, although it is a short but stiff 8.5km climb averaging about 7.5%, with sections of 9%. No one was bothered by the cold and wet, due to the effort of climbing, and we marveled at the 2 to 3 metre walls of snow on either side of the road near the top of the col. What a huge effort had been made to clear it! After a quick high-5 the three of us headed down the other side to Villars. The plan was to have a Brevet support van meet us in Villars with changes of clothing, in case we were soaked and freezing. We all arrived in Villars a little chilled but still psyched for the 2nd ascent. We decided to grab a quick hot drink at a local cafe before heading back up, and that was when the wheels came off. Within just a few minutes of sitting we all cooled down rapidly and started to shiver, immediately sapping our willpower to repeat the climb and brave another chilly descent. So we packed it in and drove back to Les Diablerets in the warmth of the Brevet van. Thank God for Tom’s contingency planning! 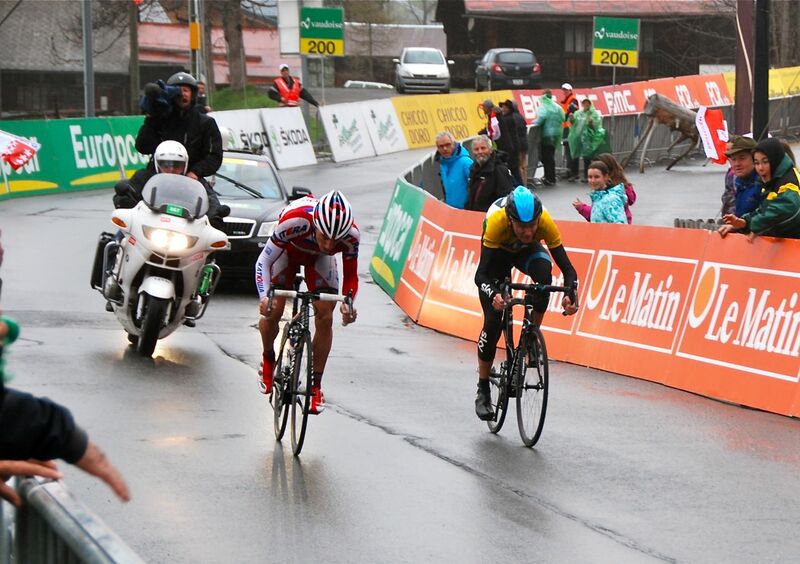 Spilak and Froome sprinting for the Stage 4 win. Back in town we continued thawing out under hot showers before joining our Brevet comrades for a walk into the race village, where we shared a pint of beer or two while watching the peloton race toward us on a giant screen. During the final long climb back up to Les Diablerets the leaders had been whittled down to a handful of riders, including Froome, Spilak (Katousha) and Pinot (FDJ). In the final kilometres of the climb Froome and Spilak pulled away and rode in tandem down the final straightaway into Les Diablerets, with Spilak taking the final sprint. 2013 World Road Champion Rui Costa (Movistar) came in 3rd. Job done for Froome in any case, as he stretched his lead to 47 seconds, giving himself a nice cushion for the final stage, an individual TT in Geneva the next day. Stay tuned for Part II, in which the Giro peloton and I take on the famous col du Galibier in the snow, and a friend and I follow the Dauphinée riders up to Alpe d’Huez! 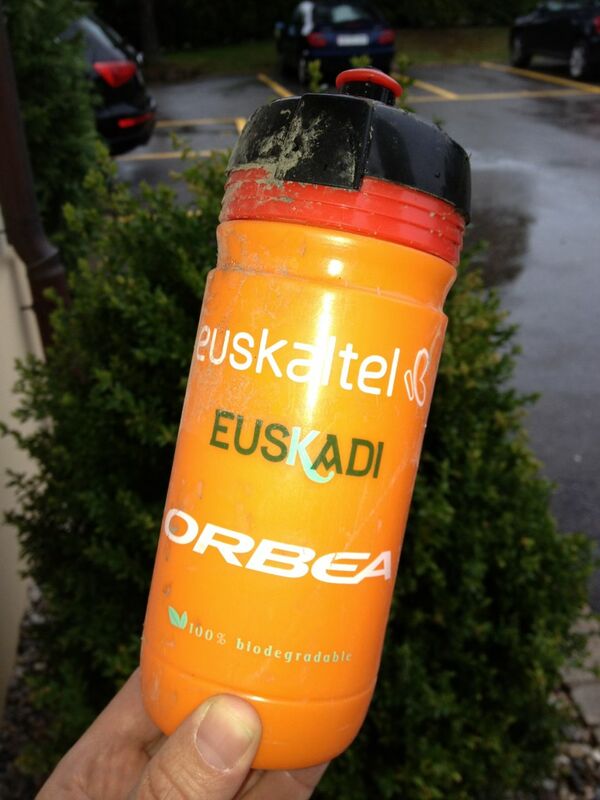 I found this team bottle on the road after Stage 4. Gotta admit, the contents tasted funny.